Connect your smartphone or tablet to this unique device and your personal robot assistant will suddenly come to life! R.BOT’s robots are designed to provide the ultimate telepresence experience for both its operator and audience who can be located anywhere in the world! 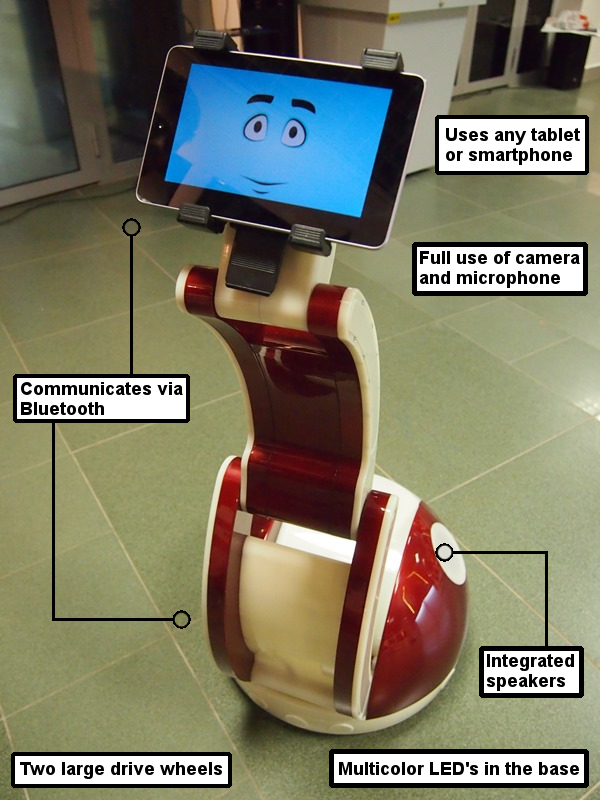 The operator can control the robot through the Internet, using a web-browser on any personal computer, laptop, netbook, tablet or even a smartphone. Our simple and intuitive web-interface provides full control of the robot, no additional software is required. 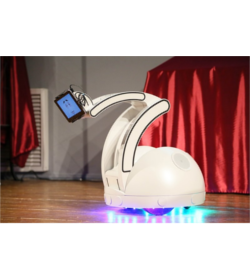 - Synergy SWAN provides the most comfortable multimedia and internet content viewing with hands-free control, the robot responds to voice commands and tracks the user’s movement in order to change the position of the mobile device’s screen. - Synergy SWAN is able to move to any desired location and complete an action, for example: start a video, play music, or read a news article from the Internet. - As a Robot-Nanny, can watch children and send an alarm if there are any changes, Synergy can also read fairy tales, show cartoons, or play games. - As a Robot-Guide at the museum, the robot responds to a human entering the museum and will suggest that they look at the most interesting showpieces while displaying a map or leading the guest to the exhibit. - In restaurant or hotel as a Robot-waiter or Robot-hostess your new robot can meet guests, recognize them and remember their preferences. - Synergy excels in Information Services for clients by using its native intelligence. - Innovative marketing, advertising, and promotional: your robot can provide information about products and services at promotional events and retail stores. - Synergy is unforgettable when entertaining: with its singing and dancing no one will forget it. - As a service in remote education Synergy allows sick children to be active in their school; at the same time allowing for foreign language classes to interact with people all over the world. - Synergy SWAN is used in hospitals so that doctors can check on patients quickly and nurses can check vitals efficiently.